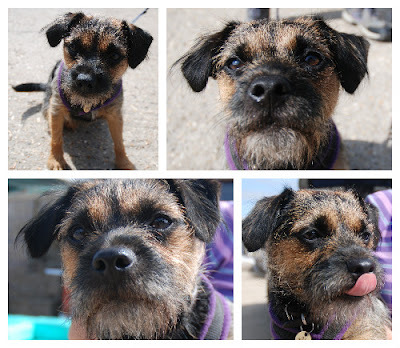 Meet Delphi.... she is a gorgeous Border Terrier I met at Hayters Feeds near Wimborne. 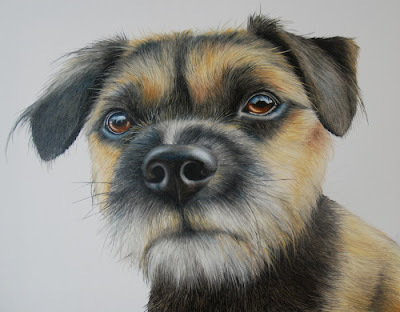 As some of you may know I stock some of my work over at the farm shop and whilst there I met Therese who works there and brings her lovely pooch Delphi with her. After seeing some of my work Therese decided she would love a portrait of Delphi and also in future one of Darcey who has sadly now passed away. I took the opportunity while there to take a few photos of her, she certainly was a natural with the camera and I got some great shots! I've done a couple of other Borders in the past and have to say they are an enjoyable yet challenging breed to paint, the texture of their wirey, fuzzy hair takes layers of paint to create but I do always like a challenge!